“Charter of the United Nations Act 1945 Listing 2015 (No. 2),” United Nations via Commonwealth of Australia, June 4, 2015, accessed August 3, 2018, https://www.dropbox.com/s/knbydc3mjwihlka/C2015G00866%20-%20Charter%20of%20the%20United%20Nations%20Act%201945%20Listing%202015%20(No.%202).pdf?dl=0. The Australian Federal Police obtained an arrest warrant for Prakash in August 2015 for his terrorist activities and requested that Interpol issue a Red Notice for him.Sean Rubinsztein-Dunlop, “Neil Prakash: Turkish court rejects request to extradite Australian Islamic State terrorist,” July 20, 2018, accessed August 3, 2018, http://www.abc.net.au/news/2018-07-20/islamic-state-terrorist-neil-prakash-could-be-released-from-jail/10016444. Prakash was reportedly killed in a U.S. airstrike in Iraq in April 2016,David Wroe, “Islamic State recruiter Neil Prakash killed by US strike in Iraq,” Sydney Morning Herald, May 5, 2016, http://www.smh.com.au/national/islamic-state-recruiter-neil-prakash-killed-by-us-strike-in-iraq-20160504-gomjgh.html. but was later revealed to be “still alive” by the Australian Federal Police.Ashleigh Davis, “Authorities ‘almost certain’ Australia's most senior terrorist Neil Prakash is still alive - months after it was announced he had been killed by an American missile,” Daily Mail Australia, June 26, 2016, accessed August 3, 2018, http://www.dailymail.co.uk/news/article-3660766/Australia-s-senior-terrorist-Neil-Prakash-alive.html. He continued recruiting online for ISIS and allegedly worked with individuals in Turkey to develop drones capable of carrying and launching missiles.Rachel Olding and Michael Bachelard, “Australian terrorist Neil Prakash may have been tracked by social media posts,” The Sydney Morning Herald, November 28, 2016, accessed August 7, 2018, https://www.smh.com.au/national/australian-terrorist-neil-prakash-may-have-been-tracked-by-social-media-posts-20161128-gsyz5w.html. ; Lucy Mae Beers and Daniel Piotrowski, “Failed Australian rapper turned Islamic State recruiter was running drone explosives plot before his arrest in Iraq,” Daily Mail Australia, December 15, 2016, accessed August 3, 2018, http://www.dailymail.co.uk/news/article-4038620/Australian-terrorist-Neil-Prakesh-head-sub-cell-plot-use-drones-attacks-Syria.html. In October 2016, Prakash was taken into custody by Turkish law enforcement agents after attempting to enter the country from Syria with fake documentation.“Turkish officials arrest Australia’s most wanted criminal,” The Queensland Times, November 26, 2016, accessed August 3, 2018, https://www.qt.com.au/news/turkish-officials-arrest-australias-most-wanted-cr/3116273/. ; “Neil Prakash: Turkish court rejects Australian extradition plea,” The Guardian, July 19, 2018, accessed August 3, 2018, https://www.theguardian.com/world/2018/jul/20/neil-prakash-turkish-court-rejects-australian-extradition-plea. ; Farid Farid, “Turkey stuns Australia, rejects extradition of terrorist Neil Prakash,” The Sydney Morning Herald, July 20, 2018, accessed August 3, 2018, https://www.smh.com.au/world/middle-east/neil-prakash-court-decision-disappoints-australia-20180720-p4zsjm.html. Following his arrest, the Australian government sought to extradite Prakash, but this request was denied in July 2018 by the Kilis Criminal Court in Turkey.“Turkish police detain wife of killed Islamic State ‘minister of war’ Shishani,” Middle East Eye, July 20, 2018, accessed August 3, 2018, http://www.middleeasteye.net/news/turkish-police-detain-wife-killed-islamic-state-minister-war-shishani-1731158553. ; Chiara Palazzo, “Australia's most wanted jihadist Neil Prakash arrested in the Middle East,” Telegraph, November 25, 2016, accessed August 3, 2018, http://www.telegraph.co.uk/news/2016/11/25/australias-wanted-jihadist-neil-prakash-arrested-middle-east/. ; Charles Miranda, “Australian ISIS recruiter Neil Prakash ‘survived’ air strike, was ‘wounded’ and has since been ‘arrested’,” News.com.au, November 25, 2016, accessed August 3, 2018, http://www.news.com.au/world/middle-east/australian-isis-recruiter-neil-prakash-survived-air-strike-was-wounded-and-has-since-been-arrested/news-story/5822f8bab2aaa2737b7a754b70d3de34. Prakash is currently in a maximum-security prison in Turkey facing terror-related charges.“Australian ISIS fighter Neil Prakash to be extradited from Turkey within months,” The Guardian, May 12, 2017, accessed August 6, 2018, https://www.theguardian.com/world/2017/may/12/australian-isis-fighter-neil-prakash-to-be-extradited-from-turkey-within-months. ; “Neil Prakash: Turkish court rejects Australian extradition plea,” The Guardian, July 19, 2018, accessed August 6, 2018, https://www.theguardian.com/world/2018/jul/20/neil-prakash-turkish-court-rejects-australian-extradition-plea. He has admitted to being a member of ISIS, but has denied any link to ISIS activity in Australia.Australian Associated Press, “Australian ISIS fighter Neil Prakash’s extradition decision deferred until May,” The Guardian, February 20, 2018, accessed August 3, 2018, https://www.theguardian.com/world/2018/feb/21/australian-isis-fighter-neil-prakashs-extradition-decision-deferred-until-may. ; Australian Associated Press, “Neil Prakash tells Turkish court he has no links to Islamic State in Australia,” The Guardian, December 27, 2017, accessed August 3, 2018, https://www.theguardian.com/world/2017/dec/27/neil-prakash-tells-turkish-court-he-has-no-links-to-islamic-state-in-australia. The next hearing in his criminal proceedings is currently scheduled for September 27, 2018.Farid Farid, “Turkey stuns Australia, rejects extradition of terrorist Neil Prakash,” The Sydney Morning Herald, July 20, 2018, accessed August 6, 2018, https://www.smh.com.au/world/middle-east/neil-prakash-court-decision-disappoints-australia-20180720-p4zsjm.html. Prakash is believed to have converted from Buddhism to Islam in 2012.Michael Safi and Paul Karp, “Neil Prakash, most senior Australian fighting with ISIS, killed in Iraq airstrike,” The Guardian, May 4, 2016, accessed August 6, 2018, https://www.theguardian.com/australia-news/2016/may/05/neil-prakash-most-senior-australian-fighting-with-isis-killed-in-iraq-airstrike. At the time of his conversion, Prakash was attending the Al Furqan Islamic Centre in Melbourne, Australia where he met Harun Mehicevic, a Bosnian preacher who reportedly introduced Prakash to an extremist interpretation of Islam.“Neil Prakash: The confused Buddhist who became a top IS jihadist,” BBC, November 25, 2016, accessed August 3, 2018, https://www.bbc.com/news/world-australia-38103439. ; Nino Bucci, “Radical ‘sheikh’ who converted IS recruiter Neil Prakash silent on his death,” May 5, 2016, accessed August 3, 2018, https://www.theage.com.au/national/victoria/radical-sheikh-who-converted-is-recruiter-neil-prakash-silent-on-his-death-20160505-gonchg.html. Prakash moved from Australia to Syria in 2013 and began recruiting for ISIS.Tammy Mills, “IS fighter Neil Prakash’s apology is a self-serving ploy, say political leaders,” September 29, 2019, accessed August 3, 2018, https://www.theage.com.au/national/victoria/is-fighter-neil-prakashs-apology-is-a-selfserving-ploy-says-political-leaders-20170929-gyrl3i.html. In April 2015, Prakash appeared in an ISIS propaganda video entitled: “Stories from the Land of the Living: the Story of Abu Khaled al-Cambodi from Australia.” In the video, Prakash discussed his conversion to Islam and his hijra (migration) to Syria and encouraged Muslims, particularly in Australia, to either join ISIS abroad or to execute attacks domestically.“New Islamic State video: The story of Abu Khaled Al-Cambodi from Australia,” LiveLeak, accessed July 8, 2015, http://www.liveleak.com/view?i=6b5_1429653638. CEP has long tracked Prakash on various online platforms as he has worked to recruit Muslims to migrate to ISIS-controlled territory and to incite lone wolf attacks internationally. Although some tech companies have made an intermittent effort to ban Prakash from their platforms, Prakash was resilient in maintaining his online presence. For example, Prakash’s @AbuK313 Twitter account was suspended the day after Australian counterterrorism authorities obtained a warrant for his arrest, but he was able to begin posting under the handle @FatherOfKhalid. Prakash’s Twitter profile in September 2015. 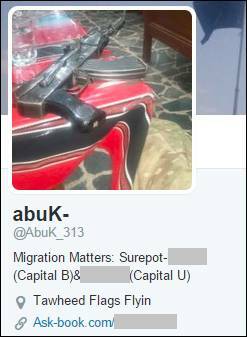 The account description references “Migration Matters,” presumably referring to migration to ISIS-held territory. The account also references his linked account on Surespot (a private messaging service), and Askbook (an interactive social media site). Prakash listed two Surespot accounts that a viewer could message if that viewer was interested in “migration.” These accounts consisted of his own Surespot account and one associated with the British ISIS recruiter Raphael Hostey. On August 30, 2015, Prakash tweeted a message inciting Muslims to violence against “kuffar,” a pejorative term for non-Muslims. Prakash was active under the Twitter handle @FatherOfKhalid in August 2015. Two days after this tweet was posted, Australian authorities issued an arrest warrant for Prakash. Prakash has used social media platforms to direct viewers to the accounts of other ISIS recruiters including the late Raphael Hostey (Abu Qaqa),Abuk, Askbook post, July 2, 2015, http://ask-book.com/ak47zRus/answer/59822661. Nasser Muthana, and Abu Dujana.Abu Khaled the Australian, Twitter post, June 10, 2015, 2:01 p.m., https://twitter.com/Ak47zNeedLove/status/608695540247883776. Like Prakash, the other recruiters in Prakash’s network have used a combination of public social media platforms and private messaging services to attract foreigners to ISIS-held territory in Iraq and Syria. 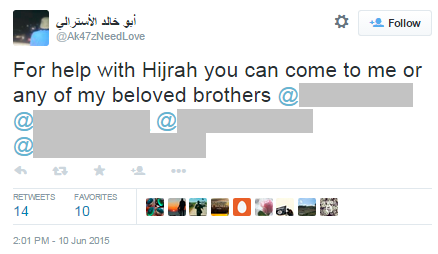 Prakash publicizes the account of fellow ISIS fighter Nasser Muthana. Prakash touts his role as a facilitator who works to bring recruits to ISIS-held territory. Prakash has employed a variety of techniques to entice recruits online. These include answering questions about his supposed daily life under ISIS’s rule,Abuk, Askbook, accessed July 8, 2015, http://ask-book.com/ak47zRus. propagating extremist and violent interpretations of religious texts,Abuk, Askbook post, July 2, 2015, http://ask-book.com/ak47zRus/answer/59810457. and even flirting with female recruits.Abuk, Askbook post, July 3, 2015, http://ask-book.com/ak47zRus/answer/59837776; Abuk, Askbook post, July 8, 2015, http://ask-book.com/ak47zRus/answer/59917803. For example, in response to the question: “Are you taken?” Prakash replied coyly that “Allah allows us to have up to 4 wives.”Abuk, Askbook post, July 3, 2015, http://ask-book.com/ak47zRus/answer/59837776. Prakash engages with potential ISIS recruits, July 2015. Prakash has suggested that viewers with logistical questions about how to migrate to ISIS-held territory should contact him via private messaging services.Abuk, Askbook post, July 8, 2015, http://ask-book.com/ak47zRus/answer/59923179; Abuk, Askbook post, July 2, 2015, http://ask-book.com/ak47zRus/answer/59823039; Abuk, Askbook post, July 2, 2015, http://ask-book.com/ak47zRus/answer/59822883. Private messaging services utilized by Prakash have included Surespot, Telegram, Wickr, and Jitsi, among others.Abuk, Askbook post, July 2015, http://ask-book.com/ak47zRus/answer/60074403; Abuk, Askbook post, August 2015, http://ask-book.com/ak47zRus/answer/60102790; Abuk, Asbook post, August 2015, http://ask-book.com/ak47zRus/answer/60426475; Abuk, Askbook post, July 8, 2015, http://ask-book.com/ak47zRus/answer/59923179; Abuk, Askbook post, July 2, 2015, http://ask-book.com/ak47zRus/answer/59823039; Abuk, Askbook post, July 2, 2015, http://ask-book.com/ak47zRus/answer/59822883. Prakash fields answers about the migration process to ISIS territory, and encourages recruits to contact him through encrypted messaging services. Prakash was identified in an ISIS guidebook published in May 2015 as one of the group’s top recruiters and facilitators.“Australian listed in Isis guidebook as go-to man for recruits,” The Guardian, May 7, 2015, accessed August 3, 2018, http://www.theguardian.com/world/2015/may/07/australian-listed-in-isis-guidebook-as-go-to-man-for-recruits. He is believed to have been involved in a foiled plot to behead a police officer on Anzac Day, an Australian national holiday, in 2015 and to have been in communication with a 15-year-old who had tried to obtain a gun and bomb-making instructions to carry out an attack on that same holiday in 2016.Lizzie Dearden, “Anzac Day terror plot: Five teenagers arrested in Australia for ‘planning Isis-inspired attack’,” Independent, April 18, 2015, accessed August 3, 2018, http://www.independent.co.uk/news/world/australasia/anzac-day-terror-plot-five-teenagers-arrested-in-australia-for-planning-isisinspired-attack-10186419.html. ; “Neil Prakash: Australia has ‘strong case’ to prosecute ISIS militant,” The Guardian, November 25, 2016, accessed August 6, 2018, https://www.theguardian.com/world/2016/nov/26/neil-prakash-australia-has-strong-case-to-prosecute-isis-militant. ; Lizzie Dearden, “Anzac Day terror threat: Australian government warns tourists over possible attack during commemorations,” Independent, April 6, 2017, accessed August 6, 2018, https://www.independent.co.uk/news/world/australasia/anzac-day-terror-threat-turkey-gallipoli-australia-new-zealand-warning-travel-advice-isis-latest-a7669981.html. Prakash was also allegedly connected to a thwarted plot to bomb New York City’s Statue of Liberty in 2015.Conor Duffy, “Neil Prakash: Australian Islamic State terrorist linked with failed Statue of Liberty bomb plot,” ABC News, January 15, 2018, accessed August 3, 2018, http://www.abc.net.au/news/2018-01-16/neil-prakash-linked-with-failed-statue-of-liberty-bomb-plot/9332146. @AbuK313Abu Khaled the Australian, Twitter, accessed July 17, 2015, https://twitter.com/AbuK313. @AbuK_313abuK- Twitter, accessed September 2, 2015, https://twitter.com/AbuK_313. @Ak47zNeedLoveAbu qaqa, Twitter post, June 27, 2015, 5:17 p.m., https://twitter.com/afroqaqa/status/614905336315682816. @FatherOfKhalidAbu Khaled the Australian, Twitter, accessed August 21, 2015, https://twitter.com/FatherOfKhalid. @itsabUk313Abu Khaled the Australian, Twitter, accessed August 25, 2015, https://twitter.com/itsabUk313. @313is313andAtone idolaters, Twitter, accessed September 17, 2015, https://twitter.com/313is313and. @AbuKambodee“Australian listed in Isis guidebook as go-to man for recruits,” Guardian (London), May 7, 2015, http://www.theguardian.com/world/2015/may/07/australian-listed-in-isis-guidebook-as-go-to-man-for-recruits. Abdullah Al Khmeree“Charter of the United Nations Act 1945 Listing 2015 (No. 2),” United Nations via Commonwealth of Australia, June 4, 2015, accessed August 3, 2018, https://www.dropbox.com/s/knbydc3mjwihlka/C2015G00866%20-%20Charter%20of%20the%20United%20Nations%20Act%201945%20Listing%202015%20(No.%202).pdf?dl=0. Abu KambodiaAbu qaqa, Twitter post, June 27, 2015, 5:17 p.m., https://twitter.com/afroqaqa/status/614905336315682816. Abu Khaled the AustralianAbu Khaled the Australian, Twitter post, May 23, 2015, 5:33 p.m., https://twitter.com/Ak47zNeedLove/status/602225839074213889. Abu Khalid the AustralianAbu Khaled the Australian, Twitter post, May 23, 2015, 5:33 p.m., https://twitter.com/Ak47zNeedLove/status/602225839074213889. Abu Khaled Al CambodiGeoff Chambers, “Revealed: Full list of Aussie jihadis fighting with ISIS in Syria and Iraq,” Daily Telegraph (Sydney), April 16, 2015, http://www.dailytelegraph.com.au/news/nsw/revealed-full-list-of-aussie-jihadis-fighting-with-isis-in-syria-and-iraq/story-fni0cx12-1227306163660. Abu Khaled al-Cambodi“New Islamic State video: The story of Abu Khaled Al-Cambodi from Australia.,” LiveLeak, accessed July 8, 2015, http://www.liveleak.com/view?i=6b5_1429653638. Abu Khalid al-Cambodi“Australian listed in Isis guidebook as go-to man for recruits,” Guardian (London), May 7, 2015, http://www.theguardian.com/world/2015/may/07/australian-listed-in-isis-guidebook-as-go-to-man-for-recruits. Abu Khalid al-KambodiDavid Wroe, “Terror plot: teenagers linked to top Islamic State recruiter Abu Khalid al-Kambodi,” Sydney Morning Herald, April 20, 2015, http://www.smh.com.au/federal-politics/political-news/terror-plot-teenagers-linked-to-top-islamic-state-recruiter-abu-khalid-alkambodi-20150419-1mock5.html. 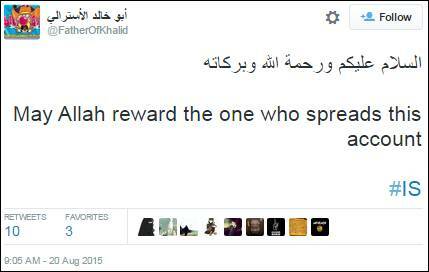 Abu Khaled al KambodiAbuk, Askbook post, July 3, 2015, http://ask-book.com/ak47zRus/answer/59823039. Abu Laghm Al Kambodee“Charter of the United Nations Act 1945 Listing 2015 (No. 2),” United Nations via Commonwealth of Australia, June 4, 2015, accessed August 3, 2018, https://www.dropbox.com/s/knbydc3mjwihlka/C2015G00866%20-%20Charter%20of%20the%20United%20Nations%20Act%201945%20Listing%202015%20(No.%202).pdf?dl=0. AbukAbuk, Askbook, accessed July 8, 2015, http://ask-book.com/ak47zRus. abuK-abuK- Twitter, accessed September 2, 2015, https://twitter.com/AbuK_313. ak47zRusAbu Khaled the Australian, Twitter post, June 30, 2015, 6:41 p.m., https://twitter.com/Ak47zNeedLove/status/616013732498571264. abUqbaAbu qaqa, Twitter post, June 27, 2015, 5:17 p.m., https://twitter.com/afroqaqa/status/614905336315682816. a47and16Abuk, Askbook post, July 2015, http://ask-book.com/ak47zRus/answer/60074403. a7andm4zAbuk, Askbook post, August 2015, http://ask-book.com/ak47zRus/answer/60102790. capuccino kambodiAbuk, Askbook post, July 7, 2015, http://ask-book.com/ak47zRus/answer/59907546. gabriel clarkAbuk, Askbook post, August 2015, http://ask-book.com/ak47zRus/answer/60195087. Kree Dafa“Australian IS recruiter Neil Prakash was a wannabe gangster rapper,” news.com.au, April 28, 2015, http://www.news.com.au/world/middle-east/australian-is-recruiter-neil-prakash-was-a-wannabe-gangster-rapper/story-fnh81ifq-1227325475637. The U.S. Department of the Treasury designated “Neil Christopher Prakash” as a Specially Designated Global Terrorist pursuant to Executive Order 13224.“Treasury Designates Australian and Southeast Asian ISIL Operatives and Leaders,” U.S. Department of the Treasury, January 10, 2017, https://www.treasury.gov/press-center/press-releases/Pages/jl0698.aspx. The Australian government designated Neil Prakash for his role as a terrorist recruiter and propagandist.“Counter-terrorism related sanctions listing,” Minister for Foreign Affairs, June 5, 2015, http://foreignminister.gov.au/releases/Pages/2015/jb_mr_150604.aspx. The United Nations imposed sanctions against Neil Prakash.“Charter of the United Nations Act 1945 Listing 2015 (No. 2),” United Nations via Commonwealth of Australia, June 4, 2015, https://www.dropbox.com/s/knbydc3mjwihlka/C2015G00866%20-%20Charter%20of%20the%20United%20Nations%20Act%201945%20Listing%202015%20(No.%202).pdf?dl=0. 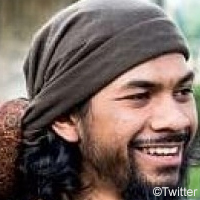 Neil Prakash, also known as Abu Khaled al-Cambodi, is an Australian recruiter and facilitator for ISIS and a U.S. I can not be bothered with the hidden messages anymore! 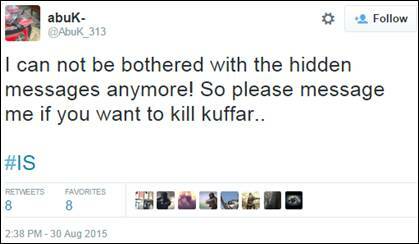 So please message me if you want to kill kuffar [pejorative term for non-Muslims].. #IS [Islamic State](Tweet)abuK-, Twitter post, August 30, 2015, 2:38 p.m., https://twitter.com/AbuK_313/status/638058235312910336. 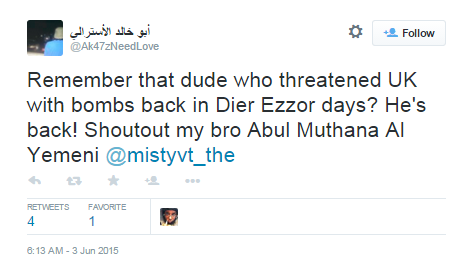 “Remember that due who threatened UK with bombs back in Dier Ezzor days? He’s back! Shoutout to my bro Abul Muthana Al Yemeni @mistyvt_the” (Tweet)Abu Khaled the Australian, June 3, 2015, 6:13 a.m., https://twitter.com/Ak47zNeedLove/status/606041016861343744. “I also send a message to my brothers, my beloved brothers in Islam in Australia, now is the time to arrive, now is the time to wake up… you must start attacking before they attack you…You kill this disbeliever… Allah has promised you a place in [heaven]. And I’d like to praise the attacks of my dear brothers and may Allah accept him and the other brothers.”“New Islamic State video: The story of Abu Khaled Al-Cambodi from Australia,” LiveLeak, accessed July 8, 2015, http://www.liveleak.com/view?i=6b5_1429653638. “If anybody were to ask me this three years ago and tell me that I would be living under sharia amongst Muslims, I would tell them they’re crazy but… look what [Allah] has planned for me. He can plan this for you, too…”“New Islamic State video: The story of Abu Khaled Al-Cambodi from Australia,” LiveLeak, accessed July 8, 2015, http://www.liveleak.com/view?i=6b5_1429653638.